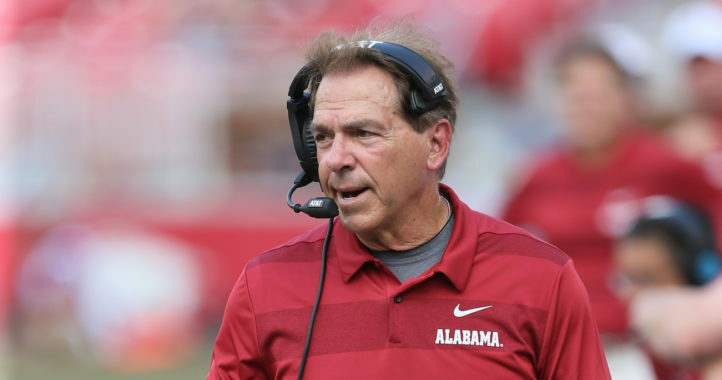 Following Tua Tagovailoa’s subpar spring game performance, Nick Saban took to the podium to answer questions about the Heisman Trophy runner-up. 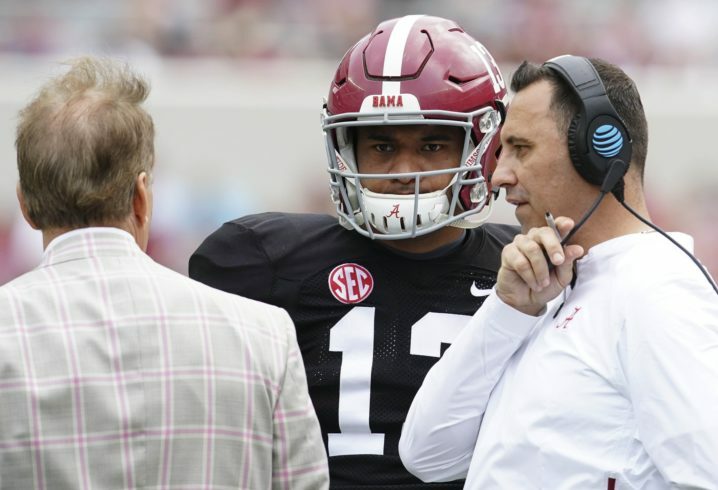 Saban was asked about the health of Tagovailoa, who dealt with ankle and knee injuries in the latter half of 2018. That question was essentially a bug on the podium that Saban smashed with his Coke bottle. “Keep trying to make something out of nothing. There’s nothing wrong with the guy,” Saban said of Tagovailoa. 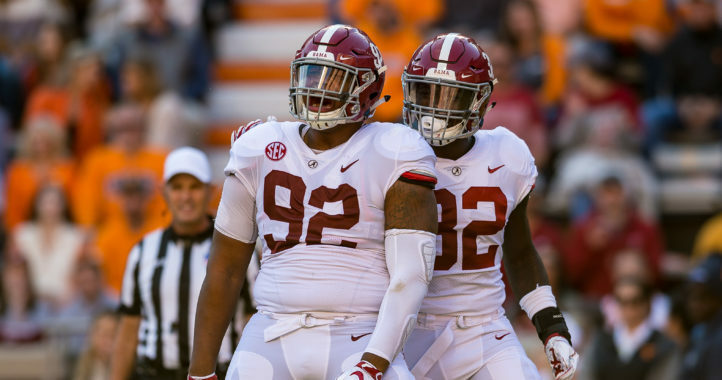 So … what are we supposed to make of what we saw Saturday, which was more like last year’s SEC Championship and national championship than any September/October performance from Tagovailoa? Like, what should we think after watching Tagovailoa deliver one of the more human performances we’ve ever seen, despite the fact that he wasn’t live, he was healthy and he has arguably the best group of receivers in America to work with? Saban basically chalked that up to just a guy having a less-than-great afternoon, while blaming the media in the process. I understand that someone who we once thought was as close to invincible as there was in college football is now, well, not invincible. Should that make Alabama fans panic? No, but it’s fair if they at least have some concern. But wait. Wasn’t it just a spring game? Yes, that’s true. Didn’t Jerry Jeudy have some uncharacteristic drops? Yes, that’s also true. And isn’t this Tagovailoa’s third offensive coordinator in as many years? A fact, that is. Still. If you watched Tagovailoa on Saturday and thought he looked like the guy who set the SEC ablaze for the majority of last season, you’re in denial. Even in a controlled setting, Tagovailoa didn’t step into as many throws, he telegraphed passes and he wasn’t nearly as precise as we’ve come to know. Contrary to what Saban said, it’s OK to acknowledge that Tagovailoa is a star who didn’t play like one Saturday. It’s also OK to point out the fact that including A-Day, Tagovailoa hasn’t looked like a star in 3 out of the past 4 games that he’s been on television playing football. But let’s get back to the other point that Saban made about Tagovailoa — there’s nothing wrong with him. I’ll take Saban’s word, Tagovailoa’s word and whatever doctor’s word that there’s no lingering effects of the special-to-Alabama surgery that it took for that the ankle to heel ahead of the Orange Bowl. But could there be lingering mental effects for the guy who made his home away from home in the medical tent last year? Absolutely. That shouldn’t have been the case Saturday. Watching him, though, it didn’t feel like he was as decisive as he was last year. He certainly wasn’t as accurate. Tagovailoa, who completed 70 percent of his passes in the regular season and didn’t throw an interception until November, barely completed 50 percent of his passes in a spring game. Yes, that’s with a new offensive coordinator. That’s also without contact and exotic blitz packages. You know, those same things that Tagovailoa dealt with when he would dice up defenses before fans could even put their hats back on after the National Anthem. The cause for concern goes back to Saban’s accusation of the media for basically putting Tagovailoa on this pedestal. Tagovailoa had zero interceptions for those first couple months, but he didn’t have zero mistakes. Clearly. That’s not my way of saying that the hype was the fault of someone like Trent Dilfer, who came on The SDS Podcast before Tagovailoa’s first start and said he could see him winning every game 50-3. Dilfer wasn’t just saying Tagovailoa was the best quarterback he’s ever scouted just to say it. But is it also possible that this tentativeness is something that Tagovailoa has since developed after being so highly regarded? Of course. We underestimate what it’s like to be a 19-year-old kid and hearing you’re going to win every game 50-3, become a No. 1 draft pick and make the Pro Football Hall of Fame. Even though Tagovailoa has the strong family foundation and he passes every test imaginable off the field, everything is different between the lines. Maybe that’s at the root of Saban’s frustration about the reaction to Tagovailoa’s performance. Tagovailoa made it look so easy. Easier than it probably was. Saban knows it’s never that easy, no matter how well someone plays to start their career. If I had to guess based on what we’ve heard and what we’ve seen, that’s what Tagovailoa is still working through. It’s not exactly the “yips” because then he’d be sailing every pass. That’s not the case at all. If it were, there’d be full-blown panic in Tuscaloosa, and understandably so. Concern is fair because there’s no guarantee that Tagovailoa ever lives up to that all-world bar during what’s expected to be his final season at Alabama. The odds still favor Tagovailoa and Alabama lighting up the scoreboard en route to another SEC title. Saturday didn’t change that, but it did serve as a reminder that Tagovailoa is far from a finished product, nor should we expect him to be in his second season as a starter. Alabama has a human being at quarterback. We’ll find out just how human he is in a few short months. Wasn’t Saban just talking about things just like this after the spring game. I’ll admit, last year every time Tua fell to the ground I held my breath. I also understand this is tackle football, things happen. This was a spring game….a spring game, with a vanilla offensive scheme. I hope we are not looking to much into this now. Tua also accurately threw the ball on many occasions as well. I’d like to think our defense had something to do also with Tua’s “human” performance. That’s actually a very good sign for the future. If you are concerned about having Tua as a QB you are truly clueless… 98% of teams haven’t a QB as good as him in the last 15 years. Tua was fine in the game. I would have been much more concerned had he shredded the defense because the defense is the biggest question mark and we needed them to look good, and they did. If you’re going to evaluate Tua in this ridiculous spring game, then at least get all the information out on the table: there were 12 sacks in this game, the o-line was a mess because multiple starters were out with injury, Tua shared time with Paul Tyson who was terrible, the running game was non-existent (Tua got 25 yards out of Najee), several drops by receivers, and facing one of the best defenses in the country. Also, the quote about the media making someone a star was in reference to Metchie, not Tua, so that’s taken out of context. Turnovers will be the topic of conversation soon enough. I am not concerned with anything from a spring game unless it’s a player suffering a serious injury…. Ditto. This is fake news on a slow news day. This kid will light it up come September. 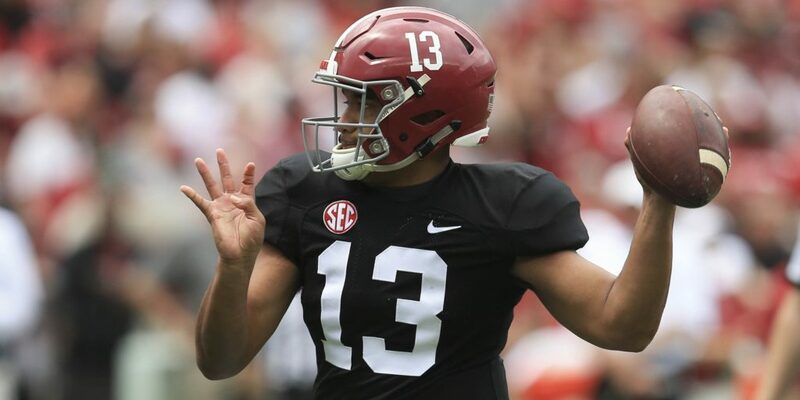 The article needs to be on his backup’s progression, not on Tua. I am not concerned about him at all. This was a spring game, and he still performed well despite a few drops from receivers. Nobody should be scared that he’s going to regress. The one thing I saw that concerned me was Tua’s reluctance to step into his throws. Is last year’s injury still lingering? Regardless, Spring games are not reliable barometers of a team’s strengths because too many pieces are still in motion. 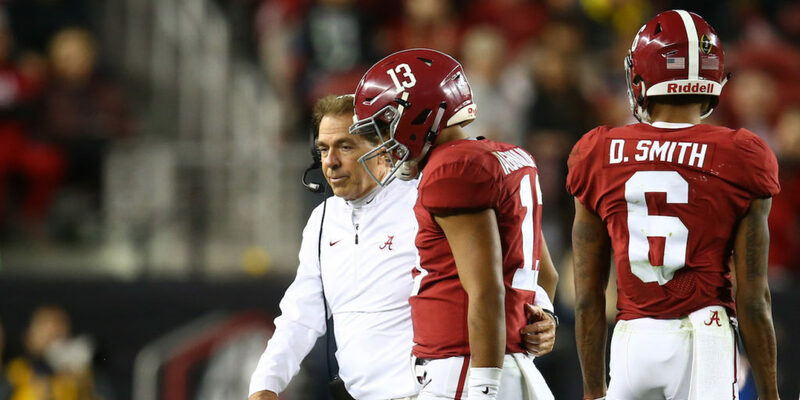 With what must be an all -out mission to atone for the sloppy and undisciplined play the Tide brought to the Clemson game high on Saban’s “to do” list, my guess is that we’ll feel a lot more comfortable with ALL aspects of his team’s readiness when they tangle with A&M. It’s a spring game and his 3rd offense to learn. Throw in 3 new lineman and them trying to mesh. None of the big stars seemed to have a great day. I do need someone to explain the 3 out of 4 games. He ripped Auburn & OU. Played injured against UGA. Again though, it’s a spring game. Yeah I don’t get it either. He destroyed Auburn and OU. While not great he was 65% against Clemson but the two picks hurt….